This entry was posted in #PPDChat and tagged #PPDChat, dad, life, mom, peer support, postpartum depression, stigma, Twitter Chat on March 26, 2012 by LHale. Join us at Twitter! Just follow the hashtag #PPDChat! This entry was posted in #PPDChat and tagged #PPDChat, dad, mental health, mom, newborn, peer support, Postpartum Mood Disorders, Twitter Chat on January 9, 2012 by LHale. 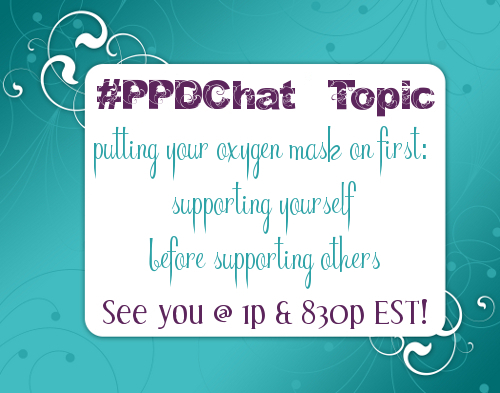 This entry was posted in #PPDChat and tagged #PPDChat, dad, mental health, mom, parents, peer support, postpartum depression, Twitter Chat on September 26, 2011 by LHale. 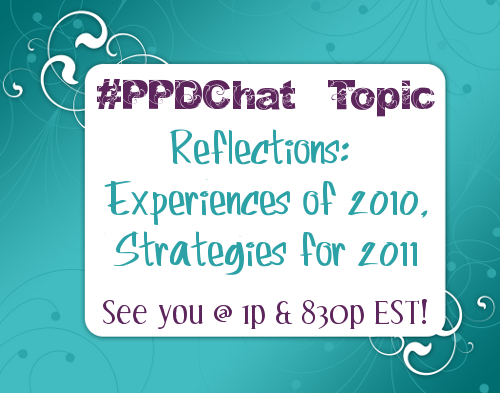 This entry was posted in #PPDChat and tagged #PPDChat, dad, End of the Year, mom, Postpartum Anxiety, postpartum depression on December 26, 2010 by LHale.